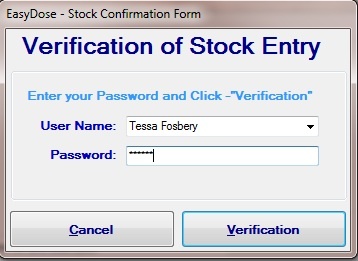 Stock Take or Stock Check functionality is accessed only from the Main Menu > Stock > Stock Take. 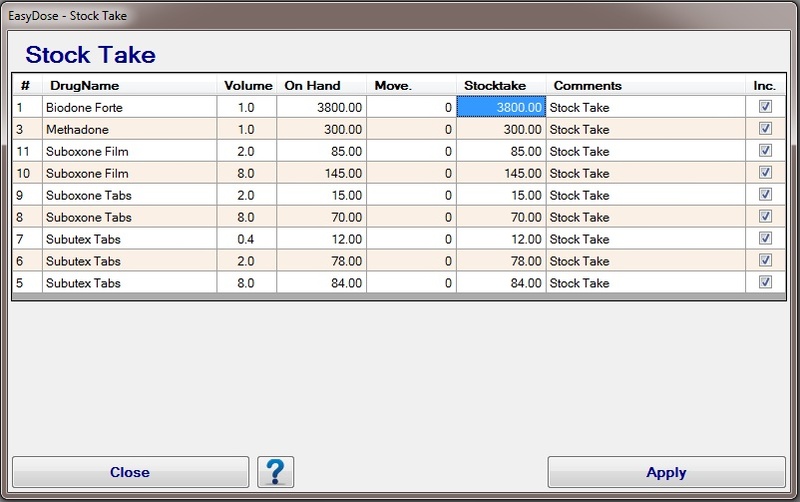 Selecting Stock Take from the drop down menu opens the following form. This form shows all the current drugs being used in the pharmacy, its volume, amount of stock calculated by EasyDose, a Movement column which calculates and records the difference between the actual amount added in the Stocktake column and the On Hand column. There is a Comments column to document the reasons for any discrepancies in stock. If Incorrect, update the Stocktake field to the actual amount of stock on hand (Note the movement column will populate +/-). Leave the corresponding Tick in the ‘Incl’ column selected and change the Comment as required. When ALL drugs have been checked and adjusted where necessary, click ‘Apply‘. 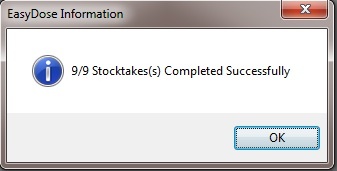 A dialog box will confirm the Stock Take is complete. Stock Takes should be performed daily at Close of Business each day. Verification of Entry form will require completion of a separate Pharmacist. 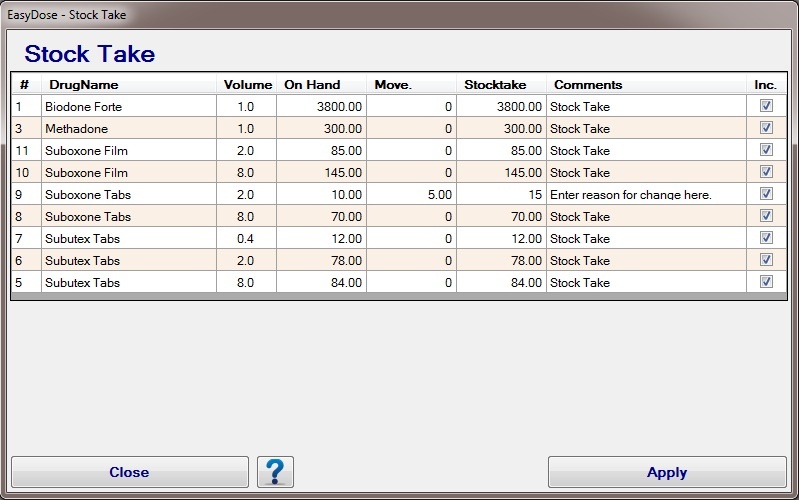 The stocktake performed will show in the Stock Movement form as depicted below. In the example above, Suboxone Tabs 2mg were adjusted (Increased) from 10 tablets to 15. Note the comment adjacent the entry. The corresponding entry can be seen in the Stock Movement form relative to that drug. An entry of the Stocktake will also be recorded in the Audit table.